Johann Kuhnau is best known as the ThomasKantor (from 1701 to 1722) who preceded Bach in Leipzig. His music is sonorous, sensitive, beautiful yet full of strength, direction and original timbres, melodies and harmonic invention. Not Bach but worth getting to know. In July 2013 Opella Musica and Camerata Lipsiensis joined forces under German keyboard player and conductor Gregor Meyer to record five of Kuhnau’s cantatas for the first time. One response was by the publishers, Pfefferkorn: they undertook to prepare and issue the first scholarly edition of Kuhnau’s cantatas in time for the tercentenary in 2022. These will be recorded by Opella Musica - presumably on CPO and under similar circumstances. Although it is estimated that Kuhnau composed more music for church than did Bach, barely thirty by the former have survived. This project by Opella Musica and Camerata Lipsiensis is nevertheless a welcome one. Indeed, listeners will be struck by the quality of the first six offerings on this CD. They are expertly interpreted, played with as much perception and musical insight as enthusiasm. Well-recorded, they make an excellent introduction to the composer, and the world in which Bach found himself in 1723. The acoustic of the St Georgen, Rötha church is warm and responsive. Strings and lower voices benefit particularly from its resonances. Yet there is no hint of muddiness or lack of clarity. At the same time, the depth and breadth of the soundstage captured by the engineers at CPO enhance our experience in the sense that Kuhnau’s persuasive music must have sounded somewhat like this when it was performed during his lifetime. In some ways, the acoustic of St Georgen is not dissimilar to the that of the Thomaskirche. Each of these pieces has a distinctive sound and feel. Indeed, variety of styles, structures, execution, texture and instrumentation is a hallmark of the earlier composer. He wrote Biblical concertos, chorale preludes, works which succeed by virtue of dramatic ensemble writing (such as the insistent closing chorus of Welt Adieu [tr.28]), and impassioned solo prayers (‘Komm, du Süßes Sterben’ in Mein Alter kömmt [tr.10]); these convey as much contentment as the more rousing movements do conviction. While the strangely outward-looking Tristis es anima mea [tr.29], the only previously-recorded work of this kind by Kuhnau which is currently available, is confident in the purpose of marrying text to music. The opening instrumental-only sonatas (like that at the start of Wenn ihr fröhlich [tr.30]) are successful almost as miniatures in their own right and not mere calls to attention. Meyer draws out of Opella Musica and Camerata Lipsiensis a sense that this is music with which we are already somehow familiar, as we might be with equivalents by Schütz or Buxtehude. Kuhnau should thus be presumed to have understood fully the relationship between text and music. For all that the doleful nature of much of the Biblical poetry here necessarily reflects the need to find solace in God. After all it follows the horrors and devastation of the Thirty Years War which only ended a dozen years before the composer’s birth in 1660, Kuhnau's powers of expression have as much beauty as they have regret or imprecation. This sense of the positive, the uplifting, for all that it is tinged with introversion, is a happy characteristic of these performers’ approach to the music. Listen to the energy which seeps out of the ‘Triumphs’ of Wenn ihr fröhlich seid [trs. 34-35], for instance. Yet triumphalism gives way to celebration of a more measured kind. The chorus and ensemble invite us into a communal experience, rather than presenting us with a jolly fait accompli. It’s typical of the best qualities in these performances that all those who were involved at the same time retain a sense of the music’s depth, taking it almost for granted and eschewing spurious effect or spectacle. Anyone new to Kuhnau will surely come away fulfilled and stimulated. Those familiar with the music and idiom of the period yet who want to further their understanding of its essence will find this CD - and, one hopes, the forthcoming project - correspondingly satisfying. For every passage that lacks bombast the same has subdued, unashamed, rhetoric. For every implicit invitation to enquire into the confessional source of such rhetoric there are well-phrased and carefully conceived musical answers. For every moment of musical gesture, there is appropriate, precise and well-turned technique. Importantly, Meyer has built this CD not as a series of curiosities with points to be made. Instead it is an enjoyable whole, a flourish of sun and shadow which will please not because that’s what his forces have set out to do but because Kuhnau’s music makes it inevitable. In the booklet with the CD are the full texts in German and Latin, with English; brief summaries of the works and their significance; and short descriptions of the performers. This is minimal for such a major series; and the font is a little small. Otherwise, CPO have lived up to their usual high standards. It’s highly gratifying to see such a project as this undertaken so well. 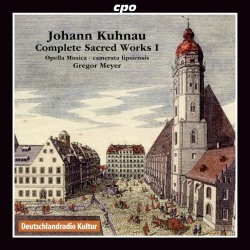 Kuhnau is poorly represented in the current catalogue: there is only one other CD devoted entirely to his sacred choral music - from King’s Consort and soloists (although excellent ones), on Helios CDH55394. The present CPO series promises to be more thorough. If the standards of precision and exhilaration set by this first generous 70 minutes of music are anything to go by, we are in for a series of worthy treats.